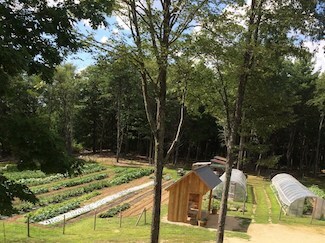 Saddleback Mountain Farm is a small, twelve-acre farm located on Saddleback Mountain in north Deerfield. We host a local CSA and sell vegetables at neighboring farmer's markets and businesses. Our farm is chemical-free and sustainable and reflects, we believe, our ongoing commitment to local food, local communities, and healthful and meaningful work. Our CSA runs from mid-June through late-October. We have two pick-up locations: Durham (Main Street Makery) and Deerfield (Saddleback Mountain Farm, 26 Saddleback Mt. Rd.